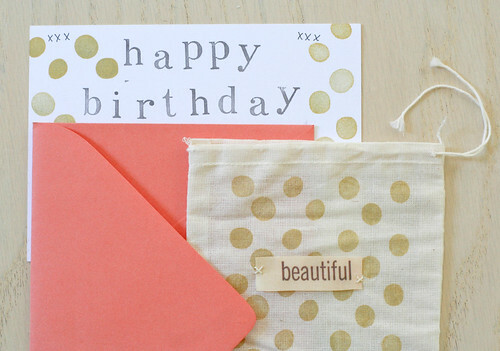 I put together a birthday card for someone this week, and I thought I'd share the fancy-shmancy "envelope" I made for her card! I buy these muslin bags in bulk, so I almost always have a few extras floating around after I've put together bundles to sell in my shop. 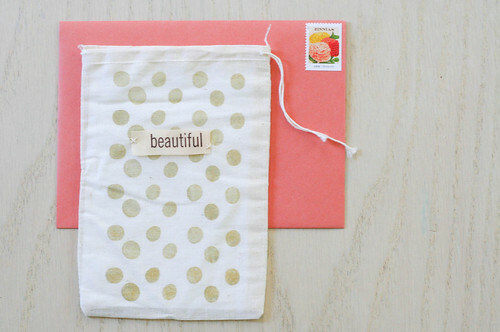 I typically use them for gifts, but I thought I'd use one to tuck a card inside—since I have a small stash of large envelopes that the muslin bags fit into perfectly. Plus, it's like sending more-than-a-card without paying more postage. Nice, right? I thought so. fabric word: found in my crafting supplies; unsure of where to find these! I stamped the bag with the ink, then added the fabric word with some simple stitching. I wish I could remember where I got the fabric word! Sometimes I get into weird moods and trash all the packaging for my supplies, telling myself it will create more space and be less messy. (Not always the case, and it's way more confusing later on when I need to buy more of something. Hindsight.) I'm sure there is some sort of tutorial for this online, though. 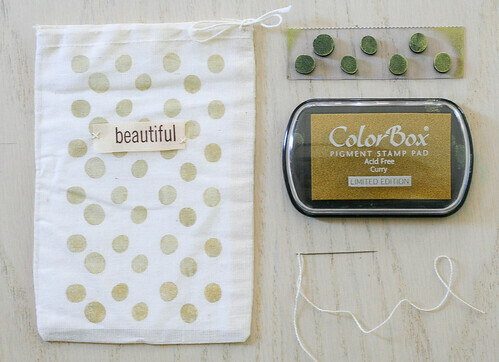 Or you could use letter stamps on a small patch of fabric to achieve the same result! 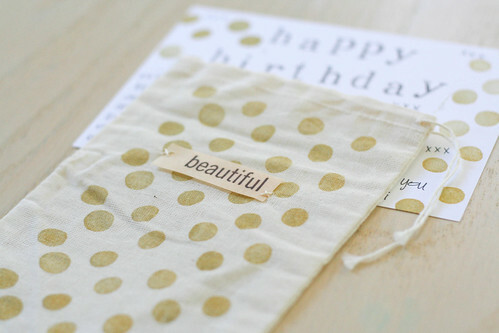 The card is just a basic flat card, and I stamped out the birthday message using this stamp set with black ink. I added some stamped circles to tie the whole thing together (because being matchy-matchy is something very close to my heart). I think the whole thing ended up looking rather nice. I like the colors, and that envelope color is pretty much the best. Oh, Paper Source. 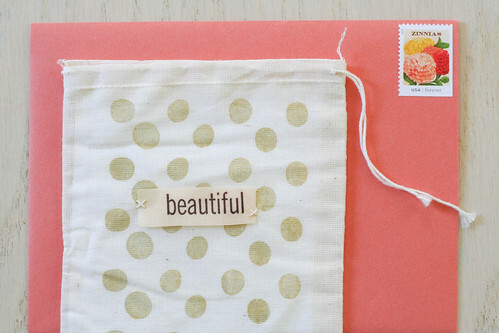 You and your pretty envelopes. I bought these ones on clearance ages ago, and I couldn't find this exact color on their website, but I think that their "persimmon" color is the closest one to this. In case you were wondering, that is. And, look! The whole thing is tied together perfectly with the colors in my new postage stamps. Does it get any better than that? I think not. Simple pleasures, my friends. Simple pleasures. I adore this. Beautifully done! Beautiful. I love your craftiness! You're too sweet—thank you, Erica!